"Easy Target" is a brand new song written by John to be performed live at 5pm ET on Thursday, January 19th one day before the 2017 Presidential Inauguration on Yahoo's The Katie Couric Interview. "Easy Target" is John’s reflection on the state of our country. 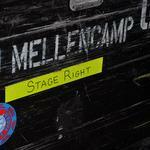 An outspoken artist, Mellencamp continues his journey to convey the truth through this passionate and plain-spoken song. Download "Easy Target" on iTunes and Spotify beginning at 6pm ET 1/19. Check out the thought provoking lyrics below. Hello! I just finished listening and watching John sing his new song, "Easy Target". Wow, what a song! Man, leave it up to John to tell it like it is in this country of ours! Absolutely fantastic. I sure hope that John includes this on the new album. I hope that John takes this as a compliment. If I hadn't of been watching him and had my head turned I"d have sworn that I was listening to Tom Waits singing that song. The voice wasn't quite as rough as Tom's, but the style was sure there. Congratulations, John! You've got a winner there. But, I had no doubts before I heard it. Just reading the lyrics the other day told me it was going to be great. Thanks, John! Hello Again! I just watched John's tremendous interview with Katie Couric. What John had to say didn't surprise me. Man, what a straight shooter. John tells it the way it is, and truly is the spokesman for the common man and woman. He puts himself on the line with his views, and doesn't care what the bigwigs think. That's my guy! Thank you, John, for expressing what so many of we middle class citizens feel. No one listens to us, so you are our voice, and i thank you for that. I think that´s a great new song. fantastic violine and melody though or because so sad. what else to sing on a day like this. thanks to John for this new music! Love the interview, and love him speaking his mind as he always does. Funny watching him be just a tad more careful about what he says these days. I applaud the song, the timing, and of course the "plain spoken" sentiment and lyrics which ring so true. Musically the song sounds very similiar to the arrangement of "The Full Catastrophe" that he performed the past tour (and I LOVED that version). Keep up the good work John!!! And hoping the words I saw somewhere in an article abou the end of the Plain Sooken tour that said "See you next summer" also ring true!